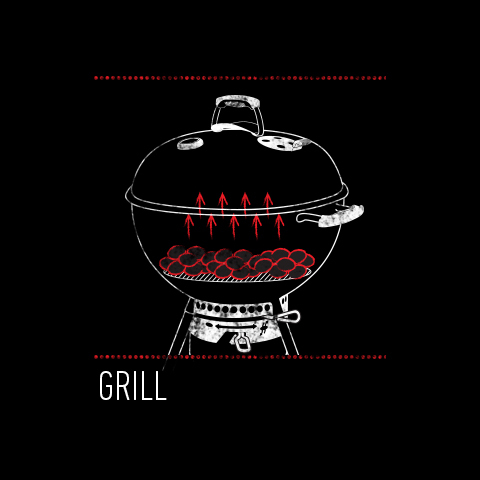 Help us help you get the most out of your Weber BBQ by reading about the best Weber barbecue cooking methods. Cooking with the lid on your barbecue is the cornerstone of why Weber's work so well. 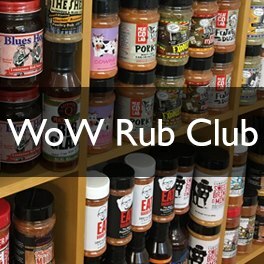 It makes it possible to cook almost anything on your barbecue. One of the many reasons why Weber is the World's Number 1 Barbecue Brand. 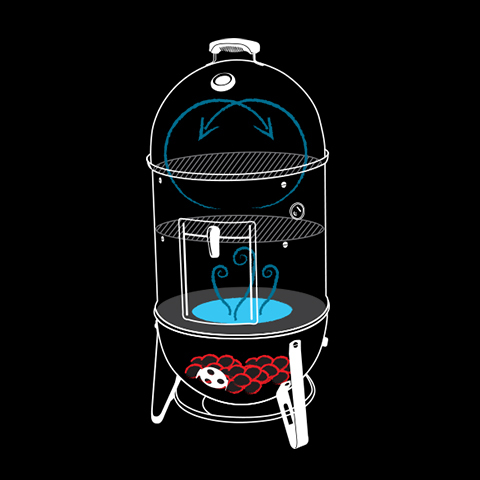 Barbecuing without a lid means that you lose heat and all that lovely smokey flavour disappears into thin air. 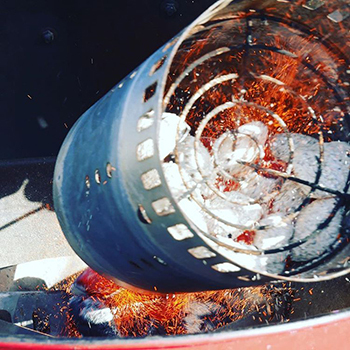 Cooking the Weber way, with the lid on, allows the food to cook evenly, the temperature is controlled and you do not risk scorching your food with flare-ups. This method is best suited to smaller cuts; think steaks, chops and burgers. Food that takes less than 20 minutes to cook. Open the lid and bowl vents. Spread glowing briquettes evenly over the grate. Put in the cooking grate and place food directly above the hot coals. If the barbecue is burning too hot, close the lid vent slightly. This method is best suited to larger cuts which needs to be cooked slower; roasts, whole chickens, ribs, bread & cakes, etc. 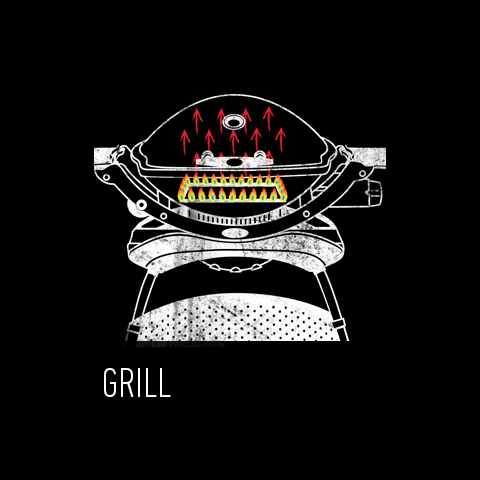 Arrange glowing briquettes on each side of the charcoal grate. Pour a little water into a drip tray and place between the glowing briquettes. Replace the cooking grate and put your food directly above the drip tray. USING THE SEAR & SLIDE TECHNIQUE, SEAR MEAT DIRECTLY OVER THE HOT COALS, THEN SLIDE IT OVER THE DRIP TRAY TO COOK THROUGH SLOWLY. Position glowing briquettes to one side of the grate. Pour a little water into a drip tray and place on the other side. Replace the cooking grate and place food to be cooked quickly directly above the coals. Place food that is to be cooked more slowly above the drip tray. N.B. If the barbecue is burning too hot, close the lid vent slightly. We recommend you always cook with the lid on. It helps the heat to circulate evenly and seals in that smoky flavour we all love. Food stays succulent and no heat is lost, so it cooks quicker too. FOR SMALL CUTS & FOOD THAT TAKES LESS THAN 20 MINUTES TO COOK. Light all the burners and turn up to full heat. Allow the barbecue to pre-heat for 5 to 10 minutes. Place the food on the cooking grate directly above the lit burners. USING THIS METHOD, THE BARBECUE WORKS LIKE A FAN-ASSISTED OVEN. GREAT FOR ROASTS, BREAD & CAKES. Switch off the middle burner(s) and arrange food above the un-lit burner(s). Turn the other burners down to medium, to lower the temperature and close the lid. 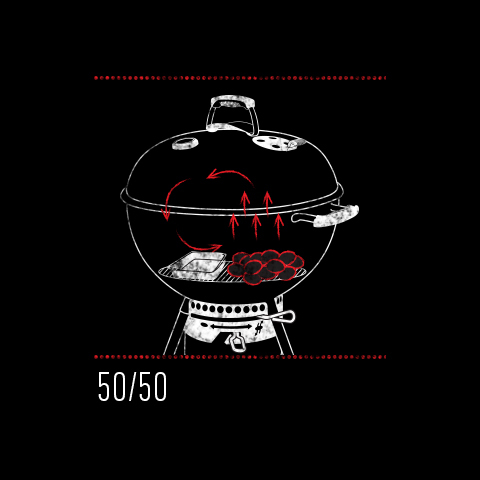 AS THE NAME SUGGESTS 50/50 ALLOWS YOU TO COOK DIRECTLY & IN-DIRECTLY AT THE SAME TIME. Switch off the middle and right or left hand burners. Sear food over the lit burner (direct heat), then move over to the un-lit area (in-direct heat) for slower cooking. FOR SMALL CUTS & FOOD THAT TAKES LESS THAN 20 MINS TO COOK. Switch the burner(s) on full. Pre-heat the barbecue for 5 minutes with the lid down. Arrange food on the cooking grate directly over the burners and close the lid. 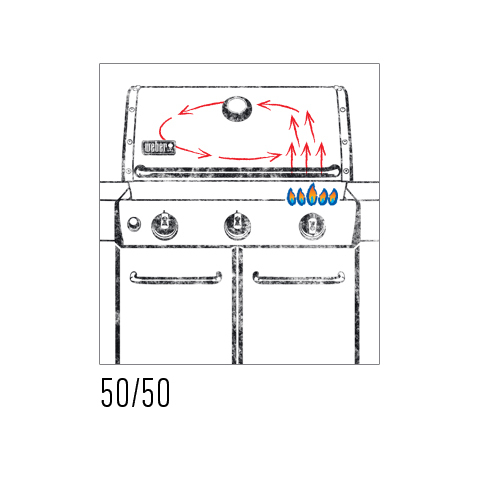 FOR Q 1000, 1200 & 2200 MODELS THE BARBECUE WORKS LIKE A FAN-ASSISTED OVEN. GREAT FOR ROASTS, BREAD & CAKES. Switch the burner on full and pre-heat the barbecue for 5 minutes with the lid down. Turn the burner down to low. Place the food in the centre of the cooking grate and close the lid. N.B. Remember to use a roasting shield and rack when roasting and baking on smaller Q models to avoid burning the underside of your food. FOR Q 3200 MODELS THE BARBECUE WORKS LIKE A FAN-ASSISTED OVEN. GREAT FOR ROASTS, BREAD & CAKES. Switch the burners on full and pre-heat the barbecue for 5 minutes with the lid down. Turn off the middle burner and place the food in the centre of the cooking grate over the unlit burner. 1	Make sure the interior of the cooker and water pan are clean. 2	Set up the bottom section of the Smokey Mountain Cooker with the charcoal grate in place. 3	For 57cm SMC - On a cool/cold day, place two chimney starter full of briquettes on top of the coal grate and light using firelighters. On a warm/hot day, one and a half will be sufficient. For 47cm SMC - On a cold day use one and a half chimney starters and on a warm/hot day, use one. For 37cm SMC - On a cool/cold day use one chimney starter, on a warm hot day, use half. 6	Place the middle section that houses the water pan and cooking grates, on the bottom section and slowly pour a gallon (4.5liters) of cool tap water through the cooking grate into the water pan. 7	Make sure all vents are open. Wait for the temperature to settle in the Smoke Zone at 95 - 120C before any food is added. 8	Place the food into the cooker. You can use the bottom grate first, then put the top grate in place and fill that with food. *Note that the top grate cooks a approximately 10C hotter than the bottom grate. 9	Open the access door and carefully place your wood chunks or chips onto the hot coals. 4-6 chunks or 2-3 handfuls of chips is enough for the entire cooking session. Too much smoke can make food taste bitter. 10	Place the lid on the cooker and monitor the temperature for 30 minutes to ensure it remains in the smoke zone. Keep the top vents fully open throughout the entire cooking process. 11	Check the temperature every 15 mins for the first hour of cooking. It is important to try and keep the temperature at 95 - 120C. Operating the bottom vents will help you achieve and maintain your target temperature. Open vents to increase temperature and close to reduce. Vents are sensitive so half way positions can be used. 12	Replenish the water pan every 1 1/2 to 2 hours as necessary. Use boiling water to maintain temperature but if the cooker is running too hot, adding cold water to the pan will bring temperature down. Do not over fill the water pan as an overflow will cause an ash cloud to rise from the coals and taint your food. 13	No peeking! Heat and smoke escape each time the lid is lifted, sacrificing flavour and increasing cooking time. Remove the cooker lid only if foiling, basting or removing the meat. Try turning meat only once throughout the cooking process. 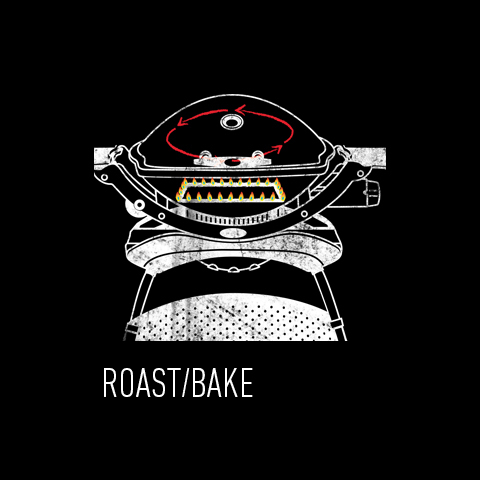 Rotisserie is one the easiest and tastiest ways to barbecue. The food constantly rotates over the heat, self-basting as it does so, resulting in a crispy outer whilst the inside remains wonderfully succulent and moist. 3 models available, to fit all Weber Q barbecues. Whilst the barbecue is un-lit remove the spit from the shield, lift the lid of the barbecue and fit the sheild into the rim. 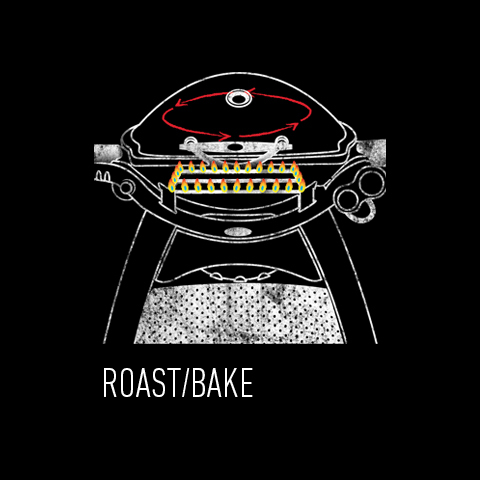 The shield is used to increase the space inside the barbecue, allowing the loaded rotisserie to turn. Light the burner(s) on full and allow to pre-heat with the lid down for 5-10 minutes before either turning off the middle burner (Q3000 series) or turning the single burner to low. To set up your rotisserie spit, skewer your meat through the middle (if it has a central bone keep as close to this as possible). Make sure the meat is in the middle of the spit and secure with the holding forks. Slide the sharp end of the spit into the hole in the motor and lower the other end into the notch on the shield, making sure the narrowest part of the spit is captured by the notch. 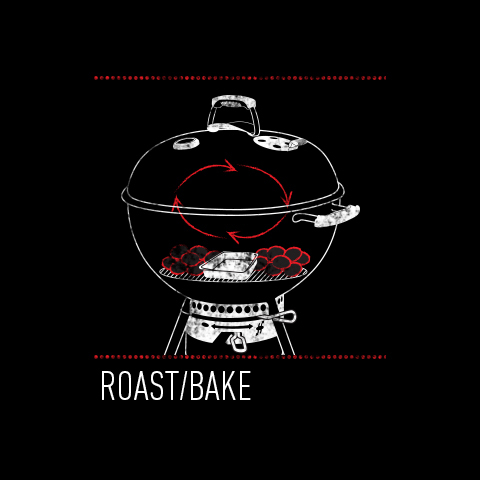 Connect the power, switch on rotisserie motor and the food will begin to rotate. Close the barbecue lid and cook according to your recipe. 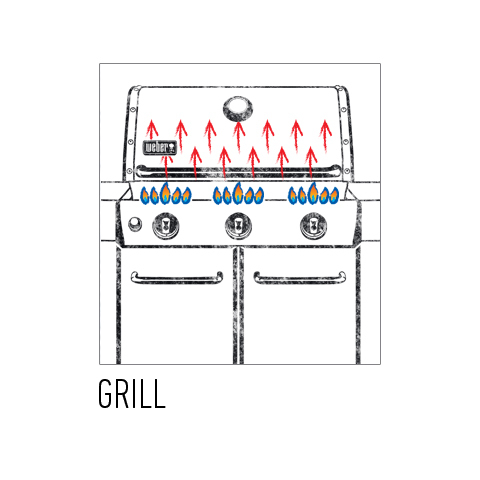 Models available for all 3-burner gas barbecues. Rotisserie is standard on Summit. Light the burners on full and allow to pre-heat with the lid down for 5-10 minutes before turning off the middle burner. Slide the sharp end of the spit into the hole in the motor and lower the other end into the notch on the the other side of the barbecue, making sure the narrowest part of the spit is captured by the notch. 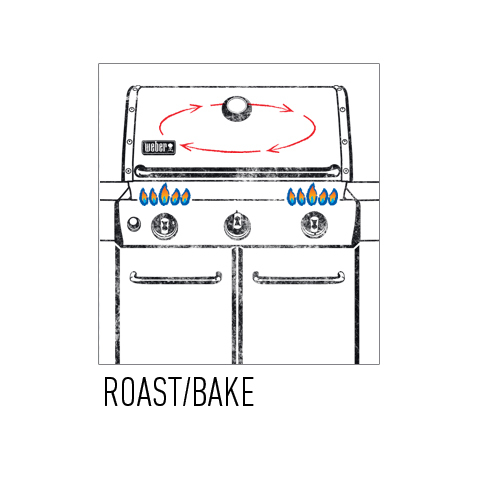 Connect the power, switch on rotisserie motor and the food will begin to rotate. Close the barbecue lid and cook according to your recipe. N.B. 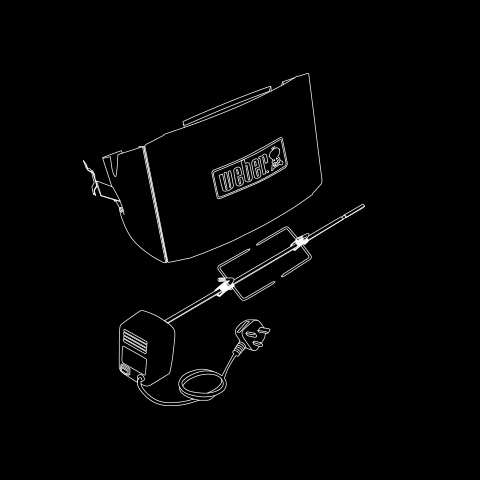 Summit barbecues have an infra-red burner in them. If using this, it should be turned off after the first 20 minutes of cooking, and the meat finished over indirect heat. ROTISSERIE BASKET & ROTISSERIE SKEWER SYSTEM. Both of these rotisserie accessories expand your cooking options. The adjustable rotisserie basket can be used for potato wedges, vegetables, fish, ribs and much more. 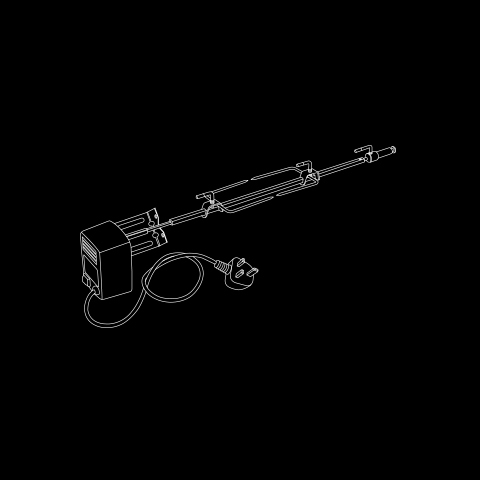 The skewer system can be used for shish and shami kebabs and even bread! 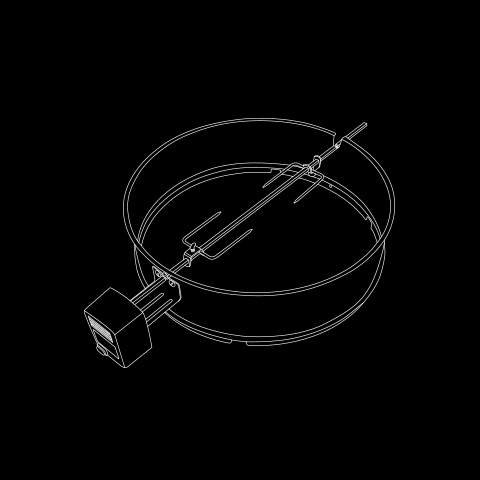 Both accessories are sold separately and fit all of the rotisserie systems shown above, except the basket, which does not fit Q100/Q1000.